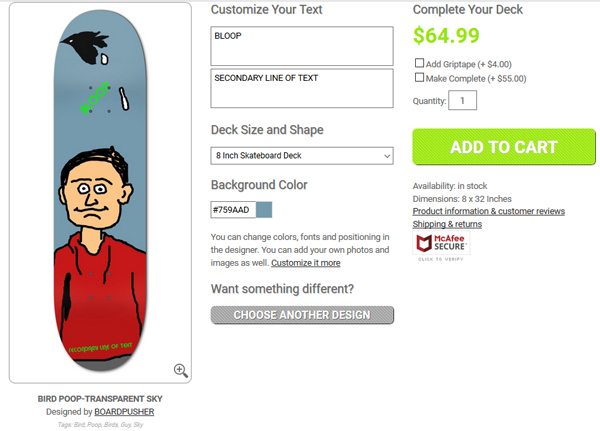 At BoardPusher.com you can create a custom graphic on one of our several different skateboard shapes. 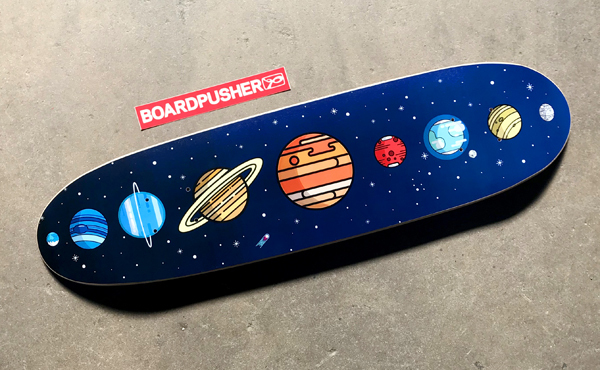 Tyler Ta took advantage of this by uploading his “Cosmos” design onto our cruiser. Tyler recently graduated from Coastal Carolina with a degree in Computer Science, but he shows off his minor in Graphic Design on this week’s Featured Deck. You can keep up with Tyler by following him on Instagram @xxtacc. 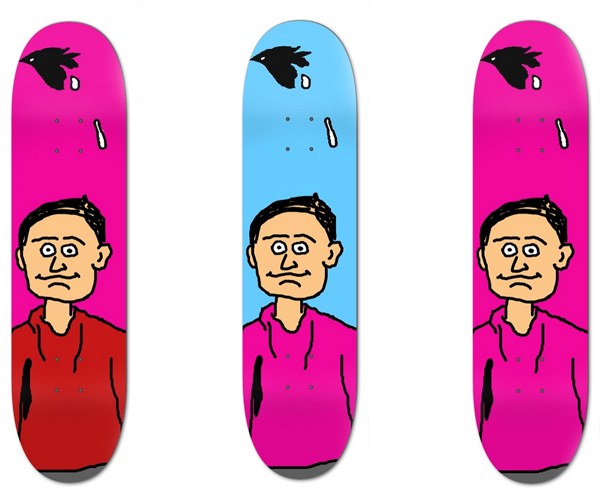 Try designing your skateboard graphic on one or all of our available shapes at BoardPusher.com. 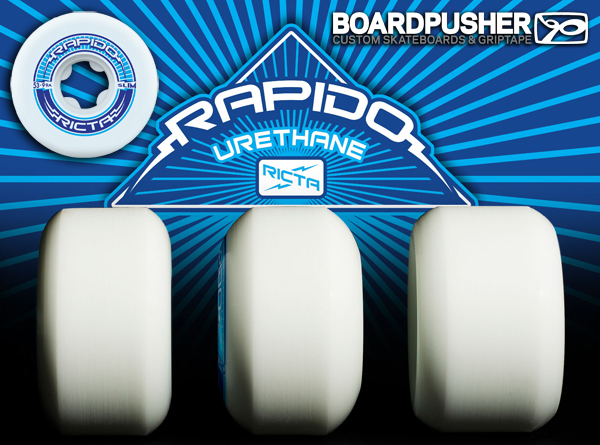 First up we’ve restocked our shelves with Ricta Wheels and 3 different sizes of their Rapidos: 51mm, 53mm, and 54mm. Ricta has been in the urethane game since 2000 with a team that includes skateboarders Nyjah Huston, Brandon Westgate, Clive Dixon, etc. and a formula that is one of the most flat spot resistant wheels in the industry. Next we’ve got some new OJ Wheels in our arsenal. We added three sizes of their Elite series: 52mm, 53mm, & 54mm. If you prefer cruising with a softer wheel we also now have 54mm 87a Keyframes. OJ’s been a respected name in skateboarding since the 80s and have experience in all facets from transition, street, park, bombing hills, and filming with a team that includes Ben Raybourn, Axel Cruysberghs, Fred Gall (one of our favorite old new schoolers), etc. To view all of the wheel options avaialbe at BoardPusher.com go here and remember to use coupon code COMPLETED to get $10 off ALL* complete skateboard orders. *Not valid on Bulk Orders of 10 or more. 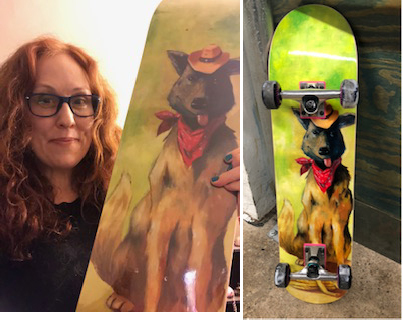 Tom Ryan is a master at getting his original, hand-painted art pressed onto BoardPusher.com Custom Skateboards. 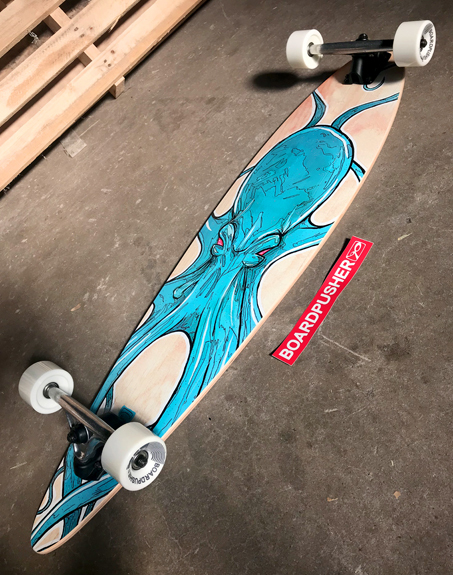 “Release the Kraken” was initially an acrylic and ink creation, but here it is digitized and pressed onto a pintail longboard for this week’s Featured Deck. 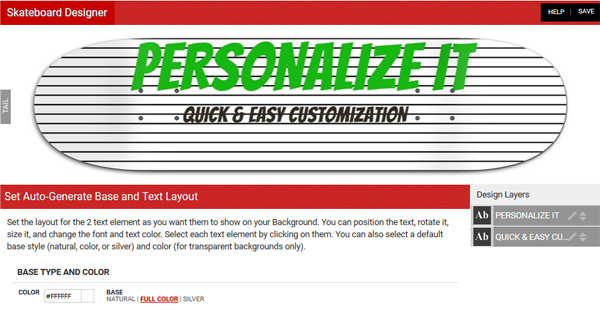 It was also completed with our basic components package. View more of Tom’s artwork at tomryansstudio.com, follow him on Instagram @tomryansstudio, and pick up one of his skateboard graphics at BoardPusher.com/shop/tomryansstudio. Design whatever your heart desires onto a pro-quality, 100% Canadian Maple skateboard deck and add trucks and wheels to make it complete all at BoardPusher.com. We see a ton of student projects come through our presses and we’re stoked to see what the future holds for the art world. 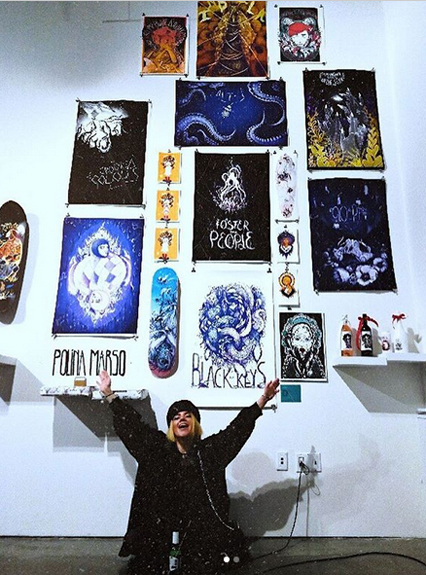 Moscow born artist turned SF resident Polina Marso used this week’s BoardPusher.com Featured Deck, Feral Bees, as part of her showing in conjunction with the California College of the Arts, where she received her BFA in Illustration. Polina’s “miraculous, mystical illustrations derive inspiration from the intricacy of nature, mythology and stories of various cultures.” Check out her website marsopolina.com or follow Polina on Instagram @marsopolina. Whether you’re a professional designer, just getting started, or simply want to skate your own design, anyone can create a custom skateboard at BoardPusher.com. 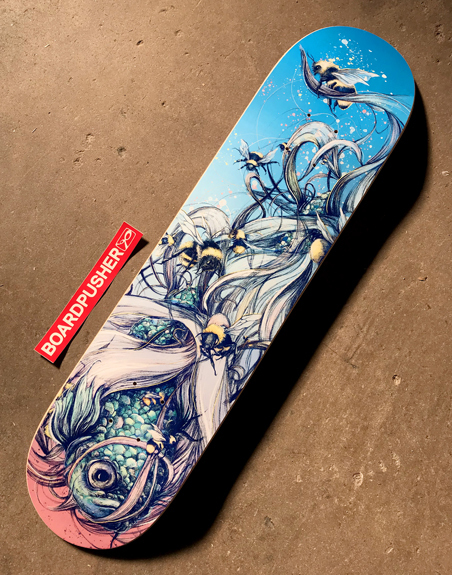 If you can dream it that we can make your custom skateboard graphic a reality too at BoardPusher.com. 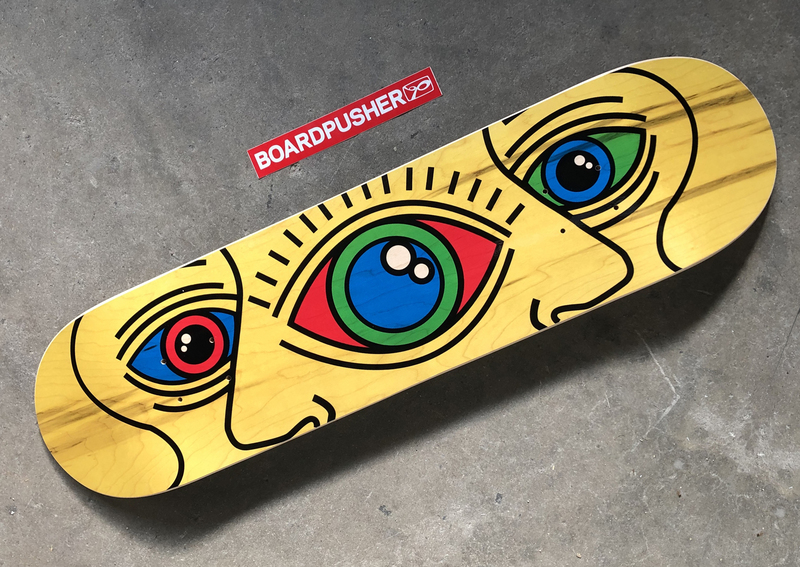 The Marlow Brand has been producing their skateboard decks through BoardPusher.com for two years now and one of their latest, The Great Unknown, is this week’s Featured Deck. Discover more from The Marlow Brand at themarlowbrand.com, follow them on Instagram @marlowskateboards, or pick up one of their skateboard designs at BoardPusher.com/shop/marlow. 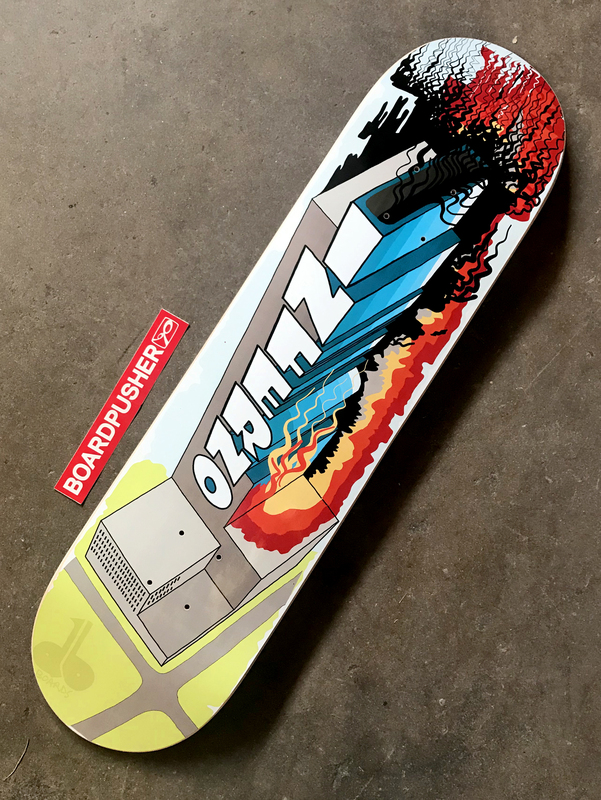 Start your own skateboard graphics line by signing up for a shop account at BoardPusher.com. 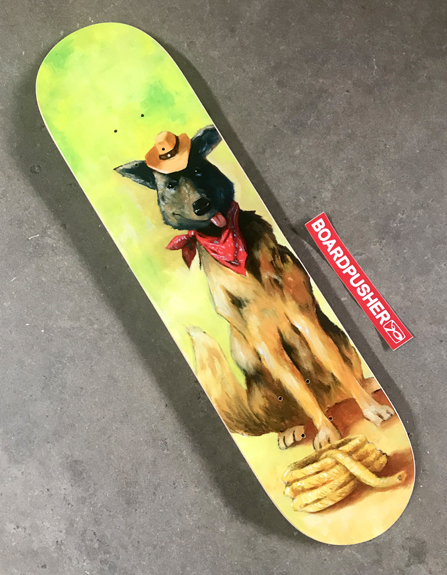 For this week’s BoardPusher.com Featured Deck, Nancy Donnelly hit up artist Matt Gauck to create a “cowdog” based on K-9 officer Jester. 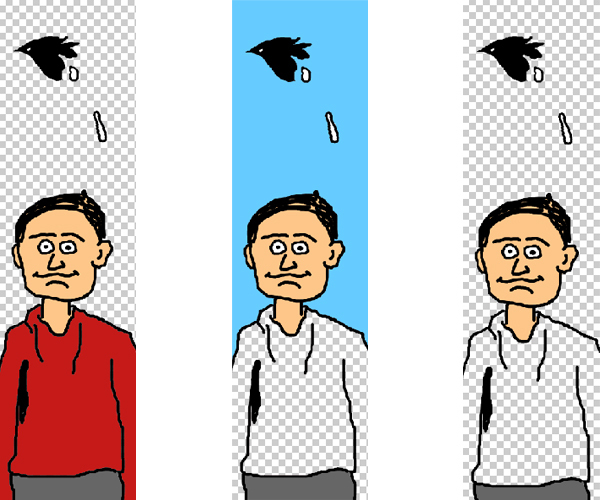 Check out more of Matt’s artwork at mattgauck.com and follow him on Instagram @mattgauckillustration. You can also follow Nancy @fancy_nancy312 and Jester @k9_jester. 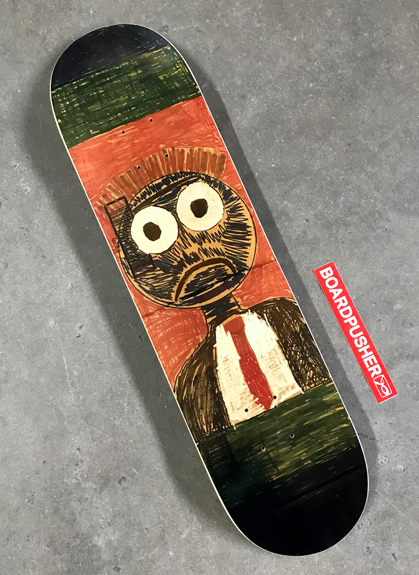 Design a graphic or get an artist friend to help you out and then upload it at BoardPusher.com to create your own custom skateboard. 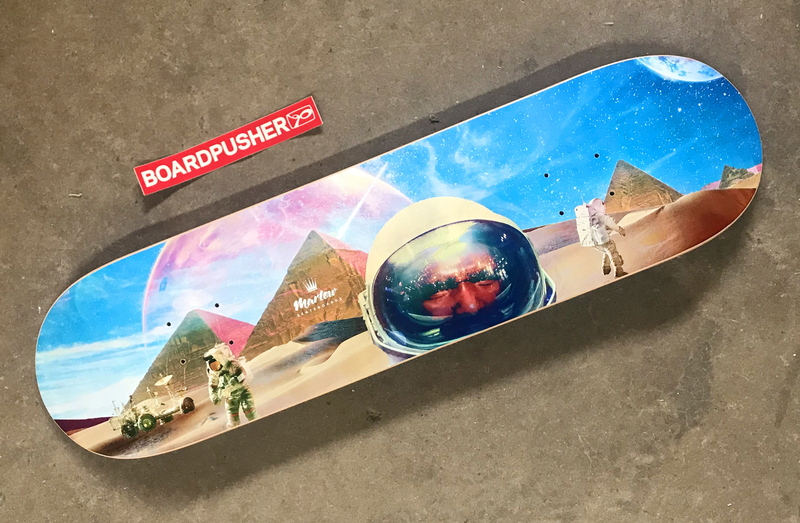 Every week we like to show you all how other folks are using BoardPusher.com to actualize their passions and imaginations. This week’s Featured Deck was created by Katie Johnson for her Graphic Design 3 class. “My inspiration was my love for eyes, and the deck is actually based off the doodles from the edge of my paper while taking notes!” You can keep up with Katie by following her on Instagram @katieeomg. Upload what inspires you at BoardPusher.com to create your own custom skateboard graphic.